Get 46221 automated home sale updates. 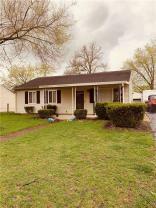 Property is located in West Indy area, a 3 bedroom, 1 bath and a 2 car detached garage home. Ready for move in but needs some TLC- needs new floorings, some cosmetic updates. This would be a perfect for your family or an investment. Great opportunity for an investor to add another cash-flowing property to their portfolio. Tenants in place have been occupying the property for over 10 years and are currently paying $550/month on a verbal lease. Come check this out today! The zip code is a very sought-after area in which to purchase a home. With 43 such listings on the market, there will never be a better time than now to make an offer.